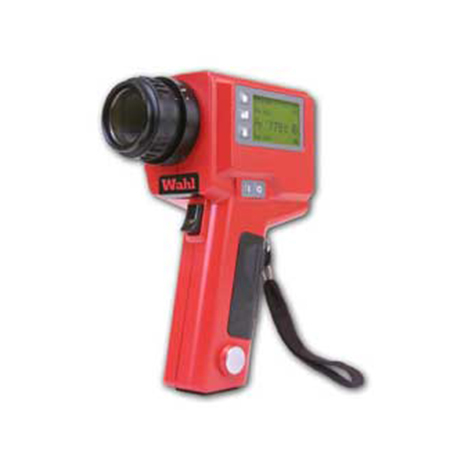 The DHS520B is a general purpose, high precision, portable infrared thermometer, designed for accurate measurement of temperatures in the range of 1022°F to 5432°F (550° to 3000°C). The measured temperature is displayed in four simultaneous modes: continuous, average, peak and valley, with user selected mode for the viewfinder display. Accurate sighting is ensured by the clear, wide angle (9°) field of view and small, clearly defined (1/3°) measurement area. Focusing is variable from 1m to infinity, with close focus options available using auxiliary lenses. Emissivity compensation is provided via the icon-based menu system. The operating waveband has been carefully chosen to minimize errors due to uncertainty in emissivity and the effects of atmospheric vapor components. Two models are available - DHS520 and DHS520B. Both provide wired RS232 serial communications. The Wahl DHS520B also features user-friendly 'Bluetooth' wireless communications.